Expert system multi-wavelength pyrometer with on-line tolerance and signal strength display, spectral and total emissivity correction, and absorption/emission compensation. Measurement is either continuous or on operator demand. Results are displayed on screen and logged in non-volatile memory. 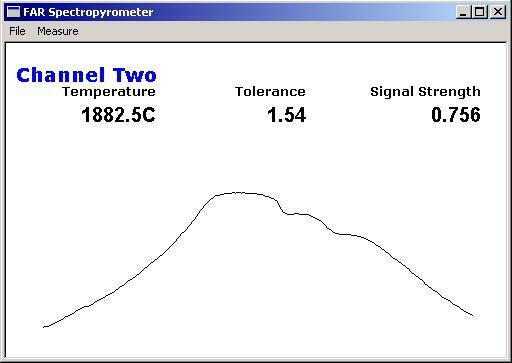 Thermal spectrum is displayed on screen, and can be saved to non-volatile memory for later analysis. Instrument consists of optical input (sensor), fiberoptic interconnection cable, and console. Console includes Intel/Windows PC Data analysis during first 30 days of operation is included.